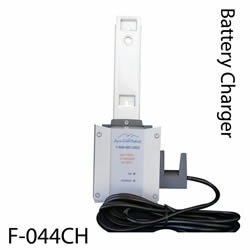 24v battery charger for all Aqua Creek pool lifts. The Aqua Creek Products Battery Charger is designed for easy-to-use and reliable charging of the 24 volt batteries used on all powered lifts. The unit will charge the battery in approximately 4 hours time. Our Battery Charger plugs into any outlet and can be converted to fit non-US power sources as well.